See St. Johns River Manatees from Your Balcony! Stay at Club Continental in Orange City, FL and see St. Johns River manatees from the comfort of your River Suite balcony! A big part of the attraction for most visitors to Florida is the state’s lush, unique, and beautiful flora and fauna. There are so many examples of fascinating wildlife and foliage rarely seen elsewhere in the country but common to our state – and Florida manatees are one of the first that comes to mind. Manatees, Florida’s state marine mammal, are a bit like what you might get if you crossed a walrus with an elephant. As a matter of fact, the manatee is a relative of the elephant! Grayish brown with thick and wrinkled, often algae covered skins, manatees average 10 to 12 feet long and weigh as much as 1,800 pounds. Almost comically pudgy-looking yet strangely graceful, manatees have flippers, round flat tails, and friendly, small-eyed, featureless faces. It is a testament to how long sailors of old were trapped aboard their ships that they saw surfacing manatees as comely mermaids! Manatees require water temperatures above 68 degrees Fahrenheit. 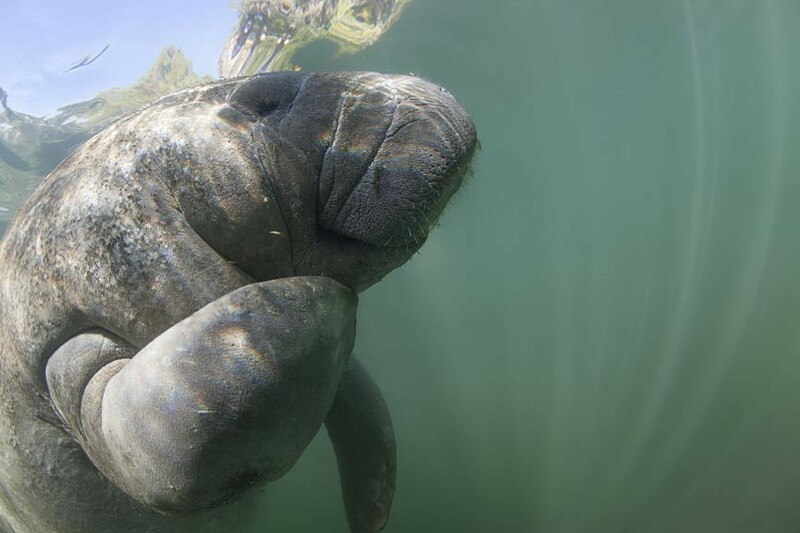 Along the Florida coast, manatees can be found in shallow rivers, bays, estuaries, and coastal shallows wherever the water is clear and warmer. While precise numbers are hard to come by, the Florida manatee population is estimated at approximately 5,000, which explains why they are protected as an endangered species. Many manatees are killed annually by run-ins with boats, despite efforts to limit such accidents. Snorkeling with manatees is a popular Florida pastime but one that is practiced with respect for these endangered and harmless, gentle giants. You can see St. Johns River manatees in their natural habitat all year ’round by boat or, if you book your stay in one of Club Continental’s fifteen St. Johns River Suites, you can see them from your private balcony overlooking the St. Johns River! Our luxurious and oversized River Suites include flat screen TV’s, microwave ovens, refrigerators, and large bathrooms. Some also include romantic, two-person Jacuzzi tubs, kitchenettes with stoves, and gas fireplaces – but all have that private balcony and a chance to view St. Johns River manatees in the wild! Relax on your private, Club Continental, St. Johns River Suite balcony and enjoy the serenity of an aggregation of manatees as they rest and play in the warm, clear, St. Johns River shallows. Rare and amazing experiences like these are why you came to Florida to begin with. At Club Continental, it’s possible to have them without even leaving your room! Book your room at Club Continental, now!